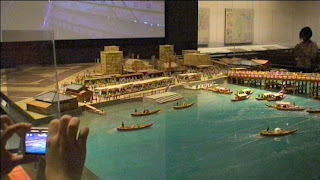 Frank had reccommended the Edo Tokyo Museum, in Ryogoku, next to the Kokugikan, Tokyo's Sumo palace. It was indeed an incredible museum. 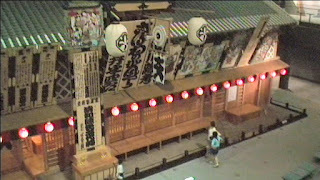 You enter on a small replica of a famous Tokyo bridge. Later you can see a small version of the same bridge. Throughout the museum, it's little replicas and big replicas from 400 years of this city's history. A childbirth diorama. Life size figures. Looks painful. 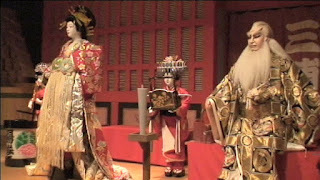 Kabuki is much better when done by dolls. Life size or not. Very impressive. 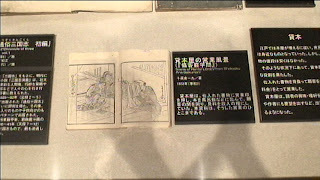 I used to collect 19th century manga, Japanese comic books, so the lengthy exhibit about their history and bookselling in Tokyo (my school was in the bookstore district) was of particular interest to me. Toys from the 50s. 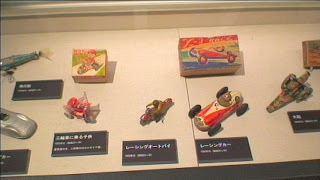 Did Fumiyo and her brother play with these? 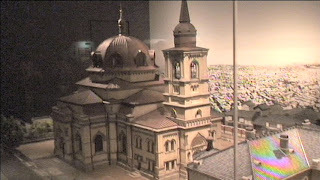 Having just walked by the real Nikolai Cathedral (see my post on tourism) it was intriguing to see it in miniature in this museum. 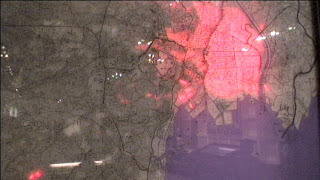 When it was built in the 1890s, it was visible from all over Tokyo. Now it's visible from accross the street, but that's about it. All in all, the museum was a perfect way to spend my last day in Japan. It summed up the trip. I regret not trying any of its food, as the pork shumai I had after was a vast dissappointment. Not really having any expectations of this museum, I was continually delighted with the displays and educated by them. It is a very kid-friendly museum, as proved by the legions of kids crawling over the exhibits and bouncing about, and it never felt like "school."